Cake Put the carrots, sugar, oil, and eggs into a large container. Stir until everything is well mixed. In another container, combine the cocoa powder, baking soda, and salt; add the carrot mix slowly, still stirring. Pour the mix into two 9-inch molds, already greased. Bake at 350°F for 25-30 minutes, or until a toothpick comes out clean when inserted into the mix. Once done, allow to cool for 10 minutes before removing from the mold. Frosting In a large bowl, whip the cream cheese and butter until spongy. Add the sugar and vanilla. In a serving plate, place one of the cake layers and spread a layer of the frosting on top. Repeat the process for the second layer of cake. Sprinkle with pecans, chocolate bits, and shredded carrots. Add cocoa powder and chocolate bits to make a chocolate frosting. 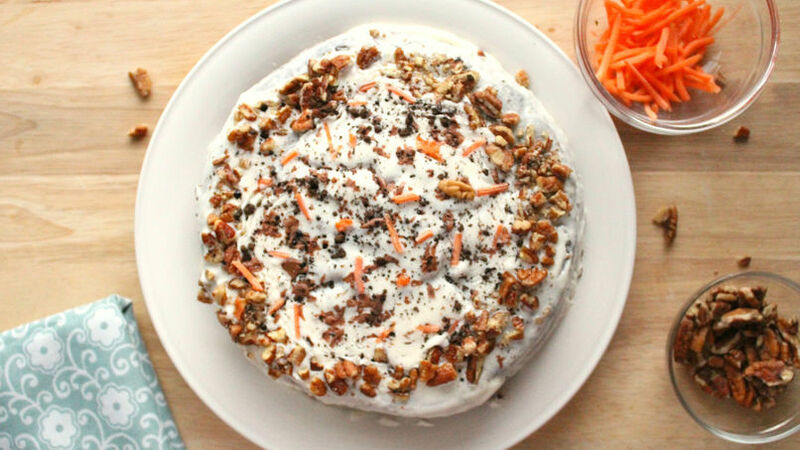 If you love carrot cake and chocolate cake, I know you'll enjoy this recipe. It combines the two flavors into one – it’s the best of both worlds! I'm talking about "Chocolate Carrot Cake". Making it is easy, and the end product is delicious. It also lets you choose which flavor you want to emphasize, whether it's the chocolate cake or the classic carrot cake. I hope you like it!